Monica and Chacho got married at the beautiful Omni La Mansion on Friday, July 29, 2011, in the evening. Their courtyard wedding was inspired by all the sights of India, and was just perfect for this fun couple. 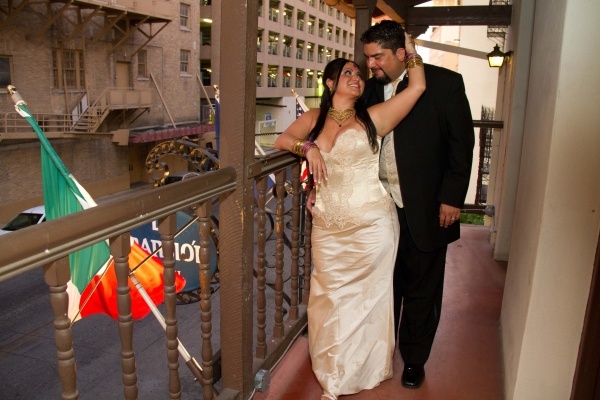 Monica had her dress custom made from Miami and was stunning in her Indian jewelry and red bindi. The bridesmaids wore a lovely fuchsia with beautiful jewelry as well. They even had the planners and I wearing bindis too! The ceremony was followed up by a cocktail hour where the guests were entertained by some awesome mariachis. They sang guest request and some traditional songs as well. After the cocktail hour the guest were lead into the ballroom where they meet all the golds, yellows, blues, purples and fuchsias of any good saree. There was a huge tent set up for the couple and the wedding party to sit under. All the guests were served a great meal and a wedding cupcake and then the party started. The band played an I don’t know if there was a time that the floor was empty. Everyone had a blast! I am so thankful to have been a part of this fun day! Congratulations Monica and Chacho!